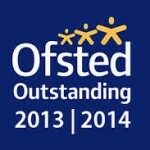 OFSTED – WE ARE OUTSTANDING – AGAIN! We are delighted to announce the result of our Ofsted Inspection on 5/6 March 2014, that we have again been rated as Outstanding – Again! A huge thank you to everyone who supported the recent Rowan Gate Variety Performance. The evening was a great success and just over £850 was raised for therapies, which is fantastic. Rowan Gate took part in Sainsburys Winter Games. A team of 4 boys from Pears class competed in a Polybat competition at the Friars Academy in Wellingborough. Polybat is a version of Table Tennis. There is no net, the sides of the table have barriers to keep the ball in play, the players use a longer and wider bat and the ball is larger too. At all times the ball must stay on the surface of the table. The aim of the game is to hit the ball off your opponent’s end of the table or cause your opponent to lift the ball off the table. After time to practice, the competition began with all the boys from Rowan Gate playing someone from Chiltern. 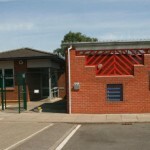 Then there were further matches versus Beanfield, Hall Meadow and Park. After all the results had come in, Rowan Gate finished 3rd – an excellent achievement as none of the boys had played Polybat before. The boys also took the time to talk to Fran Williamson. Fran is an elite swimmer who has competed and won medals at Paralympic games and World Championships. We are pleased to welcome Ofsted to our school tomorrow Wednesday 05 March and Thursday 06 March 2014.